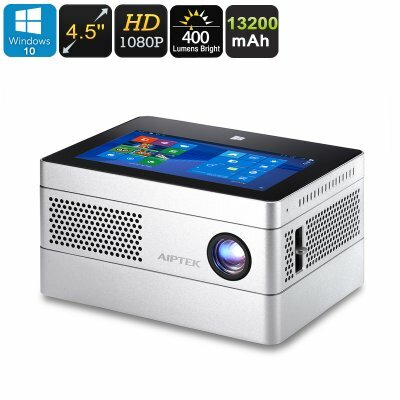 Successfully Added AIPTEK Windows 10 Mini Projector - DLP, 400 Lumen, Quad-Core CPU, 2GB RAM, 4.5-Inch Display, WiFi, 1080p Support to your Shopping Cart. Give presentations, play games, of watch movies. Everything is possible with this Windows 10 mini projector. This DLP projector has a unique stackable design thanks to which you’re able to separate its three main components. This allows you to easily pack it and carry it around anywhere you go. On the top, you’ll find an HD 4.5-Inch display. This touchscreen allows you to browse through its Windows features and easily select the file you like to project. With its 28W lamp, this Windows 10 projector produces up to 400 lumens of light. Thanks to this, you’re able to use this cool electronic gadget in dark and sparsely illuminated spaces. This HD mini projector supports 1080p files. Due to this, you are able to enjoy Full-HD movies and project them straight onto your wall. From now on, you’ll be able to enjoy a cinematic experience from the comfort if your own living room. The licensed Windows 10 operating system brings along an abundance of other possibilities. Thanks to its tablet display, you’ll be able to use this mini projector as a real-life tablet while simultaneously projecting everything you’re doing. By supporting the latest DLP technology, you are spoiled with deep colors and high details. This will truly enhance your visual experience while using this mini projector. Within its stackable body, this Windows 10 mini projector packs a Quad-Core processor that has been clocked at 1.33GHz. It furthermore holds 2GB RAM and 32GB internal memory. Thanks to all this hardware, you’ll be able to sufficiently enjoy games, movies, and other sorts of media. For those of you that need more storage, this mini projector holds a 64GB SD card slot. This offers plenty of space for you to save all your media and files without needing to worry about storage space. With its WiFi support, you are always able to browse the web while at home or in the office. It furthermore packs a large 13200mAh battery that lets you use this Windows projector wirelessly for 2 hours. Additionally, this battery can be used as a power bank to recharge your phone or tablet. This Windows 10 projector comes with a 12 months warranty, brought to you by the leader in electronic devices as well as wholesale electronic gadgets.. The power bank ensures a cable free projection of up to 2 hours without an external power source.